Teddy Hermann Young Rabbit, is fully jointed and made of the finest beige mohair. he has black safety eyes and wears a red scarf. 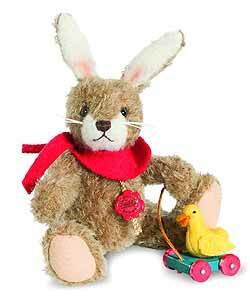 As every child should have a toy, this young rabbit has his own wooden pull-a-long on wheels. Item number 101222, Safety eyes, synthetic filling, mohair material is surface washable only, non growler, Size 20cm tall.